NYC, 02/12/2019, 2:00PM. The Blind Side (2009): Great transformation of a homeless boy. The story of Michael Oher, a homeless and traumatized boy who became an American football player and first round NFL draft pick with the help of a caring woman and her family. 129 min. Director: John Lee Hancock. Starring Quinton Aaron, Sandra Bullock, Tim McGraw. 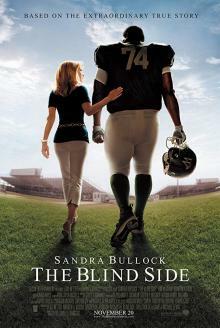 The Blind Side grossed over $300 million. Bullock went on to win the Academy Award for Best Actress, as well as the Golden Globe Award for Best Actress and the Screen Actors Guild Award for Outstanding Performance by a Female Actor in a Leading Role. The film also received an Academy Award nomination for Best Picture.